When searching for a local dentist that can treat the whole family, qualities such as efficiency, consistency, and compassion are crucial. At his practice in Rochelle Park, NJ, Alan Rubin, DMD and his staff promote these as part of their goal to provide exceptional dental care for families in Bergen County. We are dedicated to building relationships along with healthy, beautiful smiles with the families who visit our practice. Understanding what motivates our patients helps Dr. Rubin and his team address their dental issues and concerns. Our comprehensive treatment plans accommodate all members of the family, from children as young as three to patients rounding a century. We conduct thorough examinations and collect accurate x-ray images to administer precise procedures for the repair and restoration of our patients’ natural smile. Given the hereditary relationship of common dental afflictions, such as receding gums or tooth decay, our Rochelle Park dentist takes into consideration your family’s medical history when recommending proactive, preventive care measures for your enduring wellness. At our Rochelle Park practice, our staff takes a gentle and accommodating approach when caring for the needs of our older patients. To allow patients to enjoy the participation in social activities, like eating and speaking, they are accustomed to, we can construct and repair dentures. For the comprehensive oral health of our senior patients, the treatment options we have available can provide a host of benefits, from restoring bone density through grafting procedures to replacing missing teeth with dental implants. Why Bring Kids to the Dentist Early? 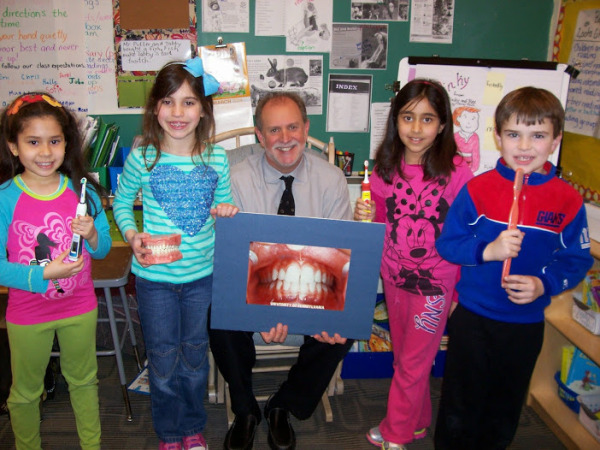 In order to prepare them for a lifetime of healthy smiles, our Rochelle Park dentist, Dr. Rubin, welcomes children into his office with open arms and teaches families proper methods for maintaining healthy teeth. Dr. Rubin provides preventive treatments, such as fluoride administration and sealants installation, in order to preserve the primary teeth for the length of your child’s adolescence, promoting proper speech development and eating habits. A proactive approach to your child’s dental health can make the difference between needing dentures and having an entire mouth of strong, healthy teeth in adulthood. If you are seeking a compassionate family dentist, let us help you end the search. For more information about services we provide for the whole family, call or visit our office in Rochelle Park to schedule an appointment with Dr. Alan Rubin today!